Austin & Williams’ CEO Rick Chiorando throws more than one kind of perfect pitch. Long before he was wowing clients and managing creative, Rick impressed scouts and managed plays on the baseball field. He signed with the Detroit Tigers and played for one year before hanging up his jersey and picking up his pen. (Yes, it was that long ago). His love of the game never retired, and he spent the next 30 years playing on various leagues. This was great for Rick—but not so good for his shoulder. 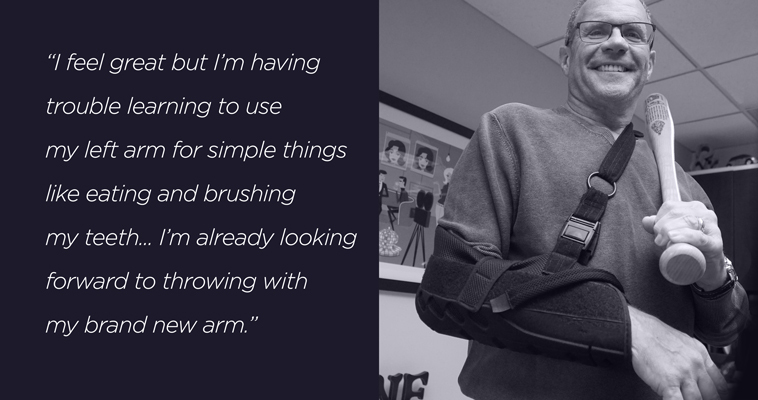 Fortunately for him, the Orlin & Cohen Group, Long Island’s leading private orthopedic practice, is a longstanding A&W client. Rick explains how a brief “acting” stint in a video for the subspecialty group led to his recent rotator cuff surgery. Austin & Williams: How did you injure your rotator cuff? Rick Chiorando: I’ve been playing baseball my whole life; my parents said I starting throwing when I was still in my crib. I played my whole childhood, through college, and for a year in the majors. Whether I was catching or fielding at shortstop, I was always throwing fast and hard. Even after I stopped playing professionally, I never stopped playing. I spent years in competitive and recreational leagues, some of them playing with other retired athletes. Fifty-five years of playing hard started to catch up with me, or at least with my rotator cuff, but it wasn’t until I started a boot camp workout that the pain became constant. A&W: What made you choose A&W’s client Orlin & Cohen? RC: It was really funny actually. We were doing a video shoot about three years ago and needed an actor for Dr. Price’s scene. We needed a doctor/client conversation, and I told him about the pain in my shoulder with such detail that afterward he asked if it was a true story. When I told him it was, he told me to come in for a check-up. He immediately knew there was a problem, and the MRI showed the tear and some other issues. Around the same time, Orlin & Cohen recruited Dr. Ticker, a world-renowned shoulder subspecialist. I knew he was the one I wanted to work with and never considered any other surgeon or practice. We tried cortisone shots for a while, but the pain always returned. Eventually, we agreed I would need surgery. A&W: What was your experience with their office like? RC: Amazing. The doctors there are top-notch and professional; these guys really have it down. The nurses and anesthesiologist were all great and made the experience smooth and easy. Their Woodbury facilities are state-of-the-art and had everything I could need. Dr. Ticker even called me four days after my surgery to see how I was doing—great follow-up. A&W: How are you feeling now? RC: I feel great, but I’m having trouble learning to use my left arm for simple things like eating and brushing my teeth. I start physical therapy soon at Orlin & Cohen and take the sling off in a few more weeks; it’s more to keep me from accidentally overexerting myself. They say it will be six months after I take it off before I’m totally healed and can use my arm normally again, but I’m confident I’ll heal faster. I’m already looking forward to throwing with my brand-new arm!